Sharekhan mobile trading app is, honestly, one of the average performing trading applications in the Indian stock market space. The primary reason for this being the case is that the broker always introduces a new mobile trading app everything their app reaches a low-level of rating. 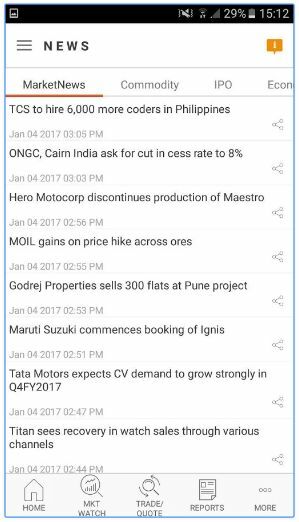 Thus, instead of working on the criticism received by the users, the broker just launches a new app altogether. Nonetheless, here is a review on the latest Sharekhan mobile trading app with information on its features, pros, cons at length. Let’s see whether the broker pivots from its mobile trading strategy or launches a new one in the coming future. When it comes to stockbrokers, Sharekhan is one of the premium names in the stockbroking industry in India. The brand offers high trust with years of experience in the Industry. When it comes to their trading platforms though, they offer Trade Tiger – a renowned name in the terminal based trading softwares space. But things do get a little dicey with the rest of the trading applications, especially with their mobile app. But they launched a new Sharekhan mobile trading app with their brand name (in the first week of May 2017) which as per Sharekhan is a much better version than its earlier mobile apps (Share Mobile, Share Mobile Pro). This needs to be known that whatever Sharekhan has tried in the mobile app space in the past, has not worked for them, ever. Update 2018: The latest sharekhan mobile trading app although started well, but again, this mobile app has seen a similar level of criticism from its users like its earlier versions of mobile apps did. Update 2019: Nonetheless, the broker has decided to stay with its mobile app and work towards its improvements. Thus, this new mobile app carries huge expectations from clients and potential new customers when it comes to performance, user experience, and analysis. Here in this review, we talk at length about Sharekhan’s new mobile app explaining its features, positives, and negatives. Before you commit to any trading application, you must be aware of all the features the platform provides in terms of research/analysis, data points, portfolio management, charting, customizations, market monitoring etc. This is important for the simple reason that the mobile trading app is the means by which you will be able to place your trades and make money in the stock market. And if the mobile app itself fails to deliver, then it simply implies you have gone to war with a broken gun. And we all know how that is going to end. 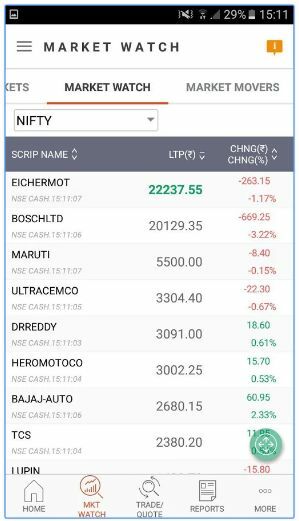 With the Market Watch feature, users may choose to select any particular scrip, check details, charts at the fundamental and technical level, view percentage and monetary change in the stock value. 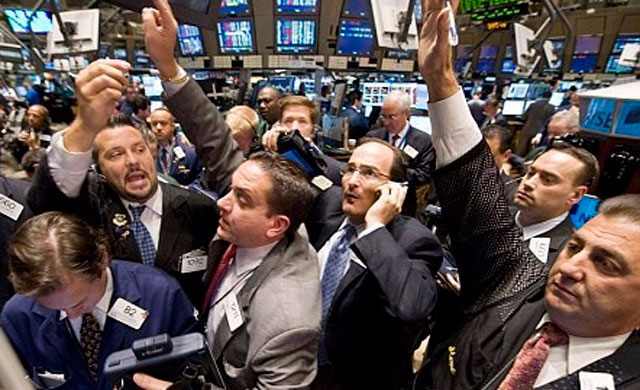 The app is connected directly to multiple feeds to provide news around the stock market, commodity/IPO space. Furthermore, with a single click user can view the detailed information around specific news as well. To make a decision, users prefer to perform a detailed analysis. 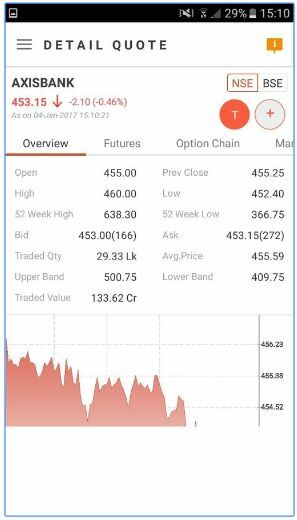 Within this mobile app of Sharekhan, users have the option to view charts (including Line, Bar, Candlestick, Area types of charts) of scrips for a particular day, week, month or years back (as per required). The charts also have features such as tracker ball and advanced chart studies. Advanced future and option search available for users looking to perform derivative trading. Currency trading within the mobile app has been introduced. This feature was missing in the earlier versions of Sharekhan’s mobile apps. You can get information on top 52-week gainers, losers with data on top turnover stocks and top volume sold stocks over a period of last 1 year. All these data points play a crucial role for a trader deciding on the specific stocks to invest or trade in. The Pattern Finder feature helps you save time and understand new trading ideas based on an objective calculation daily. Even this new version of the mobile app from Sharekhan faces performance issues (at times) and has a slight delay in order execution and feature usage. Users are required to update their password after a gap of every 2 weeks. This can be irritating, at times. The app carries a limited number of Chart types (such as hekinashi, double moving charts not available) brings less flexibility for technical and fundamental analysis. Intermittent issues with the mobile app getting hanged have been seen, which can be hazardous, especially for people looking for opportunities at intra-day level. The user can track his/her portfolio using the specific My Portfolio section within the app. Few features such as watchlists are not synchronized with other trading platforms of Sharekhan. For instance, if you created a watchlist using Sharekhan Trade Tiger, you will not be able to find the same watchlist in this mobile app with the same login. Additional security layers added on top of the ones present in previous versions. Even though there is extra security, once logged in the app does not automatically logs you out if you switch among apps or close the Sharekhan Mobile trading app itself. 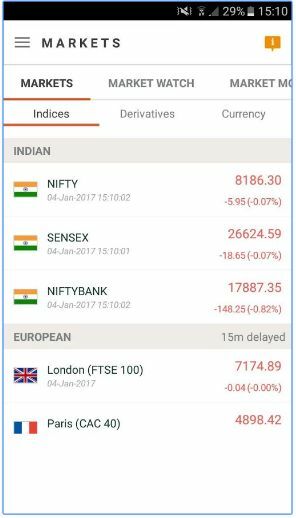 This new Sharekhan Mobile trading app offers relatively better user experience in terms of navigation, a lesser number of user clicks and overall usability. The only concern is the font size but is comparatively small. Easy fund transfer process available for pay-in and pay-out. The app offers a much higher number of features and thus, gives more options to users to perform their analysis. The app allows you to place multiple types of orders such as bracket order, normal order, AMO or After-market orders, Sell against Margin order as well. You can personalize the default screen as you log in to the application and choose any screen from options including Home, Market Movers, Market watch and Portfolio. Directly access market news feed, live research reports and tips within this app. If you like to invest in mutual funds, the app allows you to start, modify or pause your SIPs any time. In conclusion, we would like to mention that this Sharekhan mobile app is certainly better than the ones the broker has offered in the past. The areas that have improved are around user experience, usability, analysis, number of order types and more. However, still this mobile app cannot be compared with the likes of Industry leaders in this space when it comes to mobile trading. Sharekhan has a lot to prove, especially with the kind of brand name they carry and that certainly brings in high expectations and much heavy burden. Thus, by taking user feedback and with regular updates at quick successions, maybe this app gets to the point it should have already been. But it requires an intense implementation turnaround from the broker. Looking to open an Account? Enter Your details here to get a callback. there are two options for watchlist in tradetiger 1- local 2-global. either you have to open watchlist by selecting option global or 1st open locally then later you have save globally. they have released new version of mobile app in november. do share your view on same.